Stephanie, founder of Mitzvah Shirah, prepared our sons for their Bar Mitzvahs & I HIGHLY recommend! Unaffiliated with a synagogue? She will guide your child through a meaningful and spiritual Bar/Bat Mitzvah experience. She shares her passion for Torah and Jewish music through highly personalized education and a service customized to your child’s personality & creativity. She takes care of every detail, and has guided countless students to their Bar/Bat Mitzvah day with confidence & a true sense of connection to their Jewish heritage. Want your child to chant their Torah portion in Israel? She’s partnered with a rabbi in Jerusalem! She’ s also an excellent tutor to enhance your child’s synagogue learning. They are used to remove fly eggs and larva from the fur of wild animals. They work great because the bristles are close together. Before mailing, wash wands in warm soapy water to remove residual mascara. Mail form (https://www.appalachianwild.org/uploads/), old wands & donations to: Appalachian Wildlife Refuge, P.O. Box 1211, Skyland, NC 28776. Please do not purchase new wands – the program is for recycling old wands. Make great portraits using natural light-with & without flash. Topics: posing your subject, picking location, observing ambient light, & enhancing it. Includes class photo presentation of portraiture, followed by hands on practice. Students will create portraits that look professional-with flattering light & blurred background. Nice portraits can be made with any camera, though DSLRs & cameras are recommended. Register: LA Valley College – https://lavalley.augusoft.net/index. Sunday, April 14th at the Taglyan Complex in LA. Guest Speakers Ami Horowitz, David Suissa. 5:30 PM Champagne reception, open bar, sushi bar, followed by program, dinner and dessert reception. Richard Sandler, Banquet Chair. Connecting Jews to the Power of Judaism and to Each Other. For reservations/ads/questions, call 310-278-8672. Ext 601 or email aryeh@aishla.com. Tacotopia is a larger than life playground presented by Cholula Hot Sauce, a hybrid amusement park and Taco Festival all rolled up into a funky, Tacotastic, immersive exhibit. The imaginative experience is fun for all ages, and for all the non-taco lovers out there, if that exists, there are plenty of swoon worthy photo opportunities throughout the exhibit that aren’t tacocentric. The space features more than twenty-five unique environments with larger-than-life installations ranging from the Goddess of Tacos to an oversized bowl of Guac in the Guac is Extra installation. Everyday is Taco Tuesday at TACOTOPIA. MOXI, The Wolf Museum of Exploration + Innovation in Santa Barbara, is a 21st century museum for all ages where you can explore, play and discover the wonders of science + the joy of creativity throughout three floors filled with interactive exhibits. CPK in Culver City is donating 20% of their proceeds to Vista’s Foster Care Program on TAX DAY, Monday, April 15th – Lunch or Dinner- Mention Vista Del Mar! Dine in or Take out, just mention Vista Del Mar to let them know you are eating for a good cause! Looking To Help Your Child Get Into Medical School (In A Safe, Non-Scandal Way)? Check out MedSchoolCoach’s services for preparing your child to get into their dream school. They offer services tailored to your needs. Contact them for a no-cost initial consultation and discussion on how they can best help you. Looking for MCAT tutoring? Looking for advice on personal statements? Just starting out and completely lost? They can help each and every one of those situations. Feeling stressed, anxious or depressed? You are not alone! 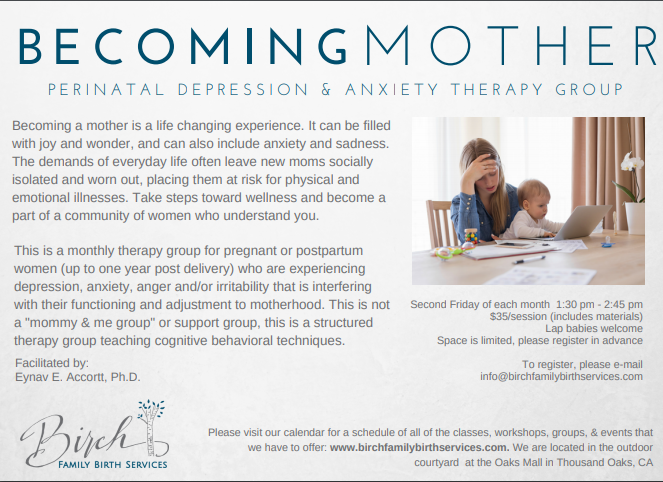 Join this monthly therapy group appropriate for pregnant or postpartum women which encourages interactive discussion and teaches cognitive behavioral skills. The group takes place on the second Friday of each month. Advanced registration is encouraged but drop ins are welcome at Birch Family Birth Services at The Oaks Mall in Thousand Oaks. To register, contact Birch directly: info@birchfamilybirthservices.com. Facilitated by Dr. Accortt, Maternal Mental Health Expert. This nondenominational service will focus on the message, “No, never. Yes, always.” The service is sponsored by the Conejo Valley Interfaith Association. Need Flip Flops For A Party Or Bar/Bat Mitzvah? Check out www.pezzel.com for flip flops in assorted sizes and designs for your upcoming event. Contact Pezzel at 888-991-3330 for more info. The ALS Association Golden West Chapter is hosting the 16th annual EF Wallengren ALS Hoopfest! Join this family-fun filled day of 3 on 3 or 5 on 5 basketball! This event is open to all ages, skill levels, and supporters of the ALS Association’s vision: Creating a world without ALS! Don’t play basketball? Come for lunch and partake in an incredible silent auction! Join Kids On Stage during Spring Break as we dive under the sea and explore the magical world of the Little Mermaid. Enjoy familiar characters, songs, theater games and arts & crafts! Ages 4-12 welcome. Pre-registration required. Joshua is a healer that channels divine energy and consciousness into the human body, to help with any issue (financial, spiritual, emotional, physical, interpersonal). He is one of the few certified VortexHealing® Practitioners in Los Angeles and is very excited and passionate to bring this healing modality to the community. VortexHealing® is an ancient healing modality using divine transformative power to heal from pain and awaken to your true being. Email healingintothelight@gmail.com. DriveWise Auto has helped MANY Jen’s List members (including myself & family members a few times!) buy & lease all makes and models competitively, conveniently and responsibly…and with amazing reviews. They do all the work, guarantee competitive pricing, a no-hassle experience, and make a donation for every purchase or lease. With unbiased advice, no pressure, and pricing that is equal to or better than what people find on their own…there’s no better way to buy or lease, and they make a donation for every car delivered. This is an opportunity to see the school and meet with Rabbi Roller to talk about all the exciting new developments coming to the Hebrew School. If you have any questions, contact Cindy in the temple office at 818-845-1734 or ccohen@btee.org. Exercise equipment, watches, costume jewelry. Kids toys and clothes for boys size 10, outdoor and indoor furniture and more! Treated like part of the family. Reasonable Rates/Long Term Discounts. Over 20 years’ experience. Cage free environment, feeding/TLC, socialization, exercise, and access to a 24 hr. veterinarian. Call Susan at 818-620-1746. Want To Be On National TV Show HGTV House Hunters? Are you selling and buying a property? Or just buying a home or vacation home? Within next 30-60 days? Lots of perks for being on the show! Email Mina@listedbyminakuper.com or call 310-345-8500. Must not already have a realtor.